The following publications are a good starting point for historical information about our parish and area. Some of the documents may now be hard to find. The PC Annual Reports which have been produced most years since 1998 are a good source if you want to find out what’s been happening in recent years. This booklet by Austin Whitaker gives an excellent introduction to the village’s history. Written in 1985, it was published by Barbara Large & Austin Whitaker, Compton, and printed by Boyatt Wood Press, Southampton. The front cover is reproduced below, with the booklet’s Foreword and Acknowledgement. This brief sketch of village history sprang from the initiative of Barbara Large and the co-operation of the late Peter Moll, Chairman in 1985 of the biennial village fête Committee. The fête gives some feeling of unity and common purpose to a widely scattered community and the Committee generously allowed any profit arising from the sale of this booklet to go toward the Parish Church Repair Appeal. It will be obvious to any reader of J. S. Drew’s “Compton Near Winchester”, 1939, how much I have used it. His family have generously given me permission to do this. I have had the same courtesy from the late Barbara Clegg and her family in allowing me to draw on her unpublished account of the village in more recent years. Many local residents have also helped me from their memories. Daphne Meller has willingly and most expertly typed the draft. For all this kindness I am very grateful. Web Editor’s note: The Acknowledgement above is printed verbatim; the Foreword has been amended to use the past tense. If we are able to get permission from the copyright holders, we would like to make the booklet’s text, and as many of its illustrations as possible, available online. The Compton area is of exceptional interest, and, having formed part of the estates of the great Benedictine Priory of St. Swithun, its early records have survived to an unusual extent. The present work is designed to show who were the people who formerly lived there, how they conducted their affairs, how they reacted to the changing conditions of national development, and what has been the history of village, roads and fields. Of special interest are the process of deforestation, social conditions at various periods, the medieval monastic farm at Silkstead, the local effects of the Black Death and the Reformation, the Roman Catholic colony in the penal days while the manner in which the smallholdings of 34 serfs have developed into two large 20th century farms is, in itself, a cross-section of 700 years of English rural history. The text of Barbara Turnbull’s paper on Drew is available on this website by permission of the Secretary of the Hampshire Field Club & Archaeological Society. This is a very valuable insight into the life and work of J.S.Drew. ABSTRACT: John Summers Drew was a gifted amateur historian who in retirement dedicated the last twenty years of his life first to the translation, study and interpretation of monastic and manorial documents of the Priory of St Swithun, Winchester (now held in Winchester Cathedral Library) and later, documents elsewhere in England. Although much of his work shows the precision and competence of a professional, he is not widely known since so little of it was ever published. This paper aims to provide a brief biography of Drew, to describe his work, and to attempt a critical assessment of his achievements and their value to other historians. Published in 2007 by Cassini Maps, based on contemporary Ordnance Survey maps, rescaled to 1:50,000. Four maps from four periods show the Winchester to Eastleigh area in 1810-1817, 1897, 1919 and the present day. We are fortunate that Compton and Shawford lies very near the centre of the area covered by this map, giving an excellent opportunity to see how our village has developed over the past two centuries. curators as “revolutionising the way in which we conduct historical research”. They also say that it “will be invaluable for future researchers wishing to dive through layers of history geographically”. 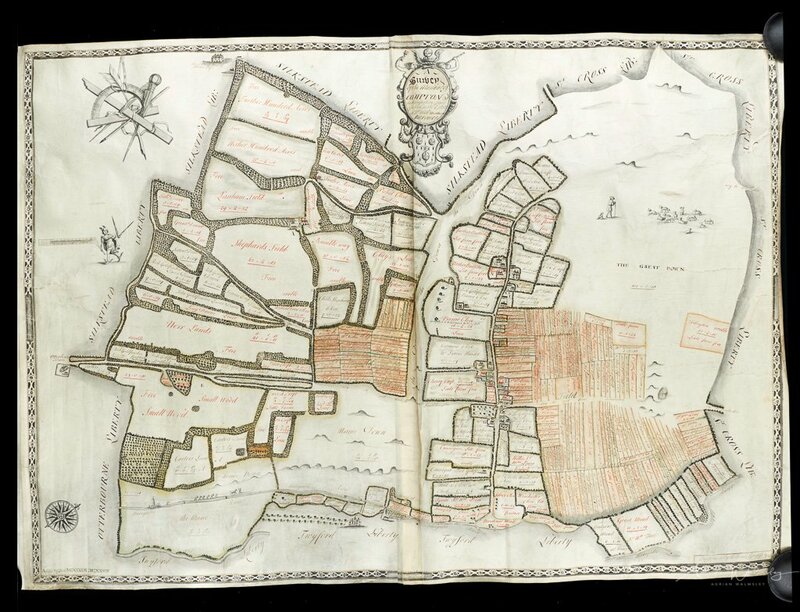 The site enables visitors to access over 130,000 historical maps from across the world including, of course, many from our area. The book is co-written by four Winchester tour guides – so they really know which snippets of history make their audiences sit up and listen. The Bloody British History series is like Horrible Histories for grown-ups – stuffed full of all the interesting bits that your history teacher left out. The book’s introduction explains that it “gives some of the sordid, tragic or simply bizarre detail which underlies Winchester’s development as the ancient capital of England, and its long history as a royal and religious powerhouse”. Two thousand years of death, disease and destruction are brought together with fiendish humour and gory detail in Bloody British History: Winchester. Available in several electronic formats: from Amazon for the Kindle, as a Google Play book, and from the Apple iBooks Store. This downloadable 8 page booklet, normally available in the church for 20p, gives a brief history of the church and lists points of interest to visitors. A 1908 view of Compton and its history can be found at British History Online. See ‘Parishes: Compton’, in A History of the County of Hampshire: Volume 3, ed. William Page (London, 1908), pp. 406-408 www.british-history.ac.uk/vch/hants/vol3/pp406-408 [accessed 10 June 2015]. The Compton & Shawford VDS was formally adopted by Winchester City Council on 10 November 2011. The main purpose of the VDS is to be a Supplementary Planning Document, which has to be taken into account in applications for planning permission in the parish of Compton and Shawford. It also contains a short chapter headed “Parish History” reproduced under VDS History . Copies of the VDS were distributed to all households in the parish in late 2011. We have a supply of extra copies to give to new people who move in to the village. For more information about the project and to download a copy, visit the Parish Plan/VDS page. The original heart of the parish and main initial settlement was Compton, but there was also a hamlet at Silkstead. Combe-Tun is loosely translated as the “settlement in the valley”, a name that crops up frequently in the geography of England. The parish was one of a dozen parishes of the manor of Chilcomb, later known as Priors Barton. Silkstead Lodge, originally the Pigeon House, owes its origins to a structure built in 1307, housing 238 birds to supply the Prior’s table. A wooden Saxon church (1015) was almost certainly on the site of the present Norman Church (1155), much of which survived the 1905 extension. The role of incumbents goes back to 1288. The village had a pub, The Chequers, which used to stand on the corner of Compton Street, and was reputed to be the oldest inn in Britain. It was closed in the 19th century but a cottage on the site bears its name. Drove Cottage in Carman’s Lane was built in the 15th century. It was formerly a thatched medieval Hall house. The Manor House in Place Lane is one of the older surviving buildings; built in 1632 it includes remains of a Tudor structure from an original building of 1205. The ruins of Compton Place, the garden wall of which is in Place Lane between the railway bridge and the Lock, was the home of a devout Catholic family, the Phillpots, whose son John (1516-1555) was Protestant Archdeacon of Winchester Cathedral. He was burnt at the stake on the orders of Mary Tudor. The present area of Compton Street, Place Lane and Carman’s Lane has been designated a Conservation Area. Silkstead was a church farm originally worked by St Swithun’s Monastery in Winchester. The houses within the parish to the east of the track in Silkstead are the remains of Priory Farm dissolved in 1539. There was also a Manor at Silkstead. In 1603 the Manor was used by Winchester College to house boys displaced by the entourage engaged in the trial of Sir Walter Raleigh in the Great Hall. They returned in 1625 to escape the plague in the City. In 1688, it became a secret Roman Catholic boarding school. The Manor has since been demolished. Silkstead now has only eleven dwellings with slight evidence of its past. Change to the parish began with the opening of the Itchen Navigation in 1710. Known as the Barge River, its main purpose was to transport coal from Southampton to Wharf Hill in Winchester. Shawford – Shouldow-Ford – had previously been very small. Apart from the Mill, possibly going back to the 14th century, the first settlements in Shawford resulted from the opening of the Itchen Navigation canal in 1710, which added accommodation for a lock keeper and bargees, but this was not until 1795. A ‘Poor House’ was established in 1795 on the site now occupied by Bridge Terrace. A spark from a train in 1898 burned it to the ground. The Village School was founded in 1838, on land leased by William Heathcote, a landowner and benefactor living in Hursley, who controlled most of the land around Compton. However, it was the arrival of the railway that brought the changes which have forged the modern basis for the parish. The railway eclipsed the canal, which carried its last cargo in 1869. The railway from Southampton to London was cut through the village by a gang of Welsh navvies in the 1830s. The first train went through in 1839 but it was more than forty years before a station was opened – initially known as Shawford & Twyford. Cathedral architect, John Colson, acquired land from the Chamberlayne-MacDonald estate and seized this opportunity to create an integrated settlement between the Down and the Railway comprising houses, the Parish Hall and the station, all built at the same time and in the same style. Something this complete is rarely found in the 21st century. The Parish Hall was the first to be erected in Hampshire under the Local Government Act in 1896. A new leisured class had now arrived in the parish; its members could live in the heart of the countryside enjoying such modern facilities as gas lighting but be only ten minutes away from their city offices. Plots around Pearson Lane were auctioned at the Bridge Hotel, as the station opened. Houses were built along the bank of the Itchen Navigation and even grander houses were built on the other side of the track in Hunt’s Lane, named after the Doctor who lived at the end of it, now more prosaically called Bridge Lane. This new settlement required services, which saw a row of shops developed opposite the Bridge Hotel. The Mission Hall, now converted into a private house, was built for evangelical worship in 1892 by the Soldiers’ Home Mission. Shops were constructed at the time. In the Great War the Hall did duty as a Red Cross Hospital and latterly a Soldiers’ canteen. Ten years later, a syndicate of property owners bought 135 acres South of Shawford Down from the Ecclesiastical Commissioners, thereby creating the Southdown Estate. At the same time a few houses were established overlooking Compton, which was the start of the fourth settlement that grew through the 20th Century into Compton Down. The last twenty years have seen continuing changes in the parish. During the late 1980s the southern part of Southdown was built on with large houses on large plots, completing a natural development of this area, in keeping with the original development plan. In the 1990s the M3 motorway carved its way between the four settlements, threatening to divide the parish. This has not happened and although the motorway has removed some traffic from Otterbourne Road, the former A33 trunk road is still a busy major road, especially when traffic is blocked on the M3 motorway. Since 2000 housing density along the Otterbourne Road has considerably increased, whilst in other areas larger individual houses have been developed, albeit on somewhat smaller plot sizes. Road names are largely faithful to the geography of the last 800 years. Red Lane was so called by 1418 and alleged to be the route along which William Rufus’ body travelled from the New Forest to Winchester. Sparrow Grove, Clease and Hurdle Way, Place Lane and Poles Lane are all to be found on ancient maps. The Roman Road from Southampton to Winchester served the parish until the end of the 17th century. It was replaced by a Turnpike in 1783. Further road changes continued, finally leading to the Winchester bypass, A33, and then the final opening of the M3 in 1995. In 1986 the BBC launched an ambitious project to record a snapshot of everyday life across the UK for future generations. A million volunteers took part including several from Compton and Shawford. Follow the links for some short comments in children’s words about life and personalities in our parish in 1986.